This is an early 20th interpretation of a Renaissance form first introduced around 1550. 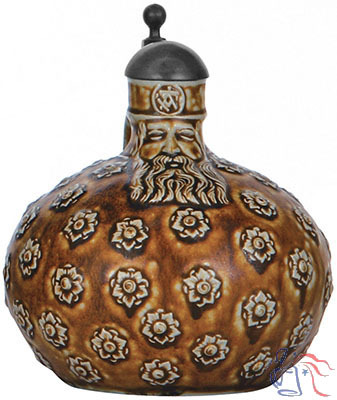 Bearded man jugs (Bartmannkrüge) feature the face of a bearded man at the neck representing the mythical woodland Wild Man of Germanic folklore, a symbol of strength and endurance. The roses decorating this example were symbolic of the House of Habsburg, one of the most important royal families in Europe and the source of Holy Roman Emperors from 1438 through 1740. 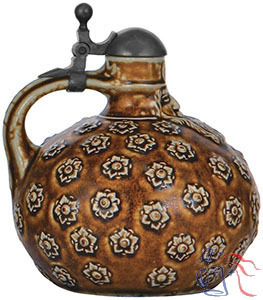 Same model number applied to a stein depicting Trumpeters with Saying.